Below you will find some of the questions more frequently asked by customers regarding waterjet technology. For additional answers, call us at 800-477-4349. 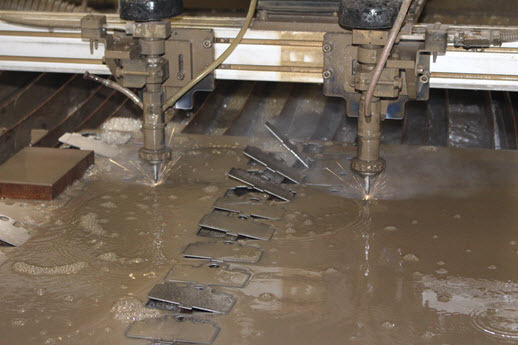 What types of Waterjet cutting equipment does Dix Metals have? Do you work on a local or national basis? What types of material do you cut? How large can the material be? What kind of projects have you produced? What about projects requiring special attention? Our company is concerned about "green" manufacturing; how environmentally friendly is waterjet cutting? Q: What types of waterjet cutting equipment does Dix Metals have? A: We utilize Flow waterjet equipment. Our first unit features a dynamic head and delivers over 60,000 PSI. Our second unit is a Flow cut dual head machine, which cuts with 60,000 PSI. Q: What are the advantages of waterjet cutting? A: Waterjet cutting is extremely precise. For example, a kerf (thickness of a cut) can be as shallow as .042”, with improved cut part tolerances up to +/- 0.005". Additionally, our waterjet machines cut up to four times faster than conventional flat stock waterjet cutting machines, which enables extremely high manufacturing efficiency and lower costs. Our waterjet machines make standard and extremely intricate cut designs with incredible precision, needing little or no finishing. Q: Do you work on a local or national basis? A: Our primary client base is within the continental United States; however, we have clients worldwide. Q: Are your rates competitive? A: Our rates are extremely competitive. We are located in California, and one of our largest accounts is on the East Coast. This client finds our quality, rates, delivery times and shipping fees to be the best in the industry. Q: What types of material do you cut? A: The vast majority of the material we cut on our waterjet machines is stainless steel and aluminum plate. This can be provided by Dix metals’ stock. A: Dix Metals can cut material as large as 7’ x 13’ and up to 6” thick, depending on material and density. Q: What kind of projects have you produced? A: Annually, we produce a great quantity of machine-ready blanks, brake parts, racing wheel components, monuments, signs, fencing, tools, architectural accents, clamps, medical device components, and much more. Q: How do your clients work with you? A: We prefer to receive CAD files; however, we can work with other file formats, and we can even utilize your drawings or sketches. Speak with one of our experts on staff; if you can envision it, we can do it. A: Because we specialize in providing machine-ready blanks in preparation for final machining, most of our clients are machine shops and OEMs. We greatly value and respect these relationships. We also work with any array of clients within the automotive and automotive aftermarket industries, home builders and architects, aerospace, military, race car component manufacturers, medical device makers, sign manufacturers, and commercial packaging and display makers. Q: What about projects requiring special attention? A: We recently completed a project for an architect working on a custom home. He designed stainless steel fencing with glass inlays that had very tight tolerances. He supplied us with CAD files, which we modified slightly to fit his exacting requirements. The result was stunning. Whether it’s a machine-ready blank or an extremely complex cutout design, we can do virtually anything in a multitude of materials. Contact us today for a fast, free quotation. Q: Our company is concerned about "green" manufacturing; how environmentally friendly is waterjet cutting? A: All scrap material from Dix Metals is collected and recycled. Even garnet, the abrasive material used in the waterjet cutting process, is recycled for future use, making Dix Metals’ cutting and grinding operations one of the greenest of its kind.